Adelaide’s Cam Ellis-Yolmen, Geelong’s Tom Ruggles and Collingwood’s Jackson Ramsay were among the AFL players axed yesterday, as AFL clubs finalise their playing lists ahead of today’s deadline. Clubs must lodge their revised playing lists with the league by 1.30 ACST ahead of delisted player free agency and the coming national and rookie drafts. Ellis-Yolmen and mature-aged forward Jono Beech – whose goal on debut against St Kilda was considered a highlight of Adelaide’s season – have been delisted by the Crows. 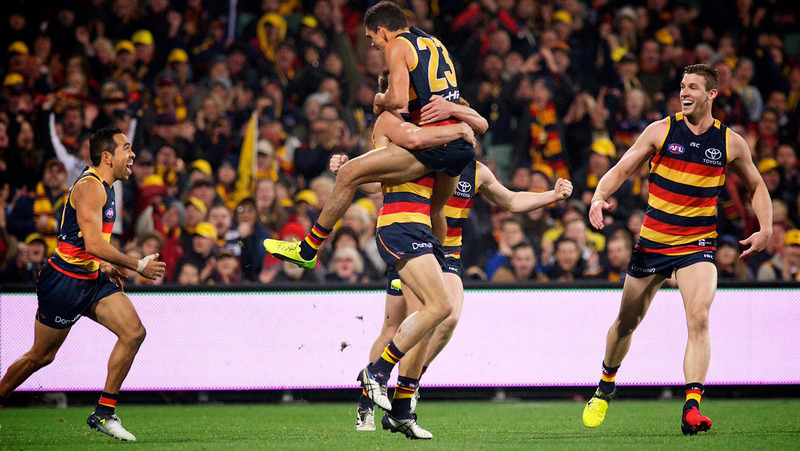 Hands down one of the best moments in our footy club! Dedication & resilient Beech man. List manager Justin Reid said Beech was “a popular member of the playing group and we wish him all the very best for the future”. “This time of year is always difficult at football clubs when some tough decisions need to be made,” Reid said in a statement. Ellis-Yolmen, who played 14 AFL games after joining Adelaide with pick No.64 at the 2011 draft, underwent a knee reconstruction and missed this season entirely. He will be offered a rookie lifeline if no other clubs sign him. The Crows have also pledged to sign Jackson Edwards, the son of 321-game veteran Tyson Edwards, as a father-son prospect at the rookie draft if he goes unpicked at the national draft. Ruggles played 18 games in his first season with the Cats in 2016 after he was a rookie selection as a 23-year-old. But he managed just four this season and didn’t earn a new contract. Matthew Hayball, selected with the 70th pick in the 2015 draft, was also delisted, but the club will take him as a rookie if he doesn’t get any other offers. Four Geelong rookies – Jamaine Jones, Zach Guthrie, Sam Simpson and Jack Henry – will stay on the rookie list next year. In addition to Ramsay, the Pies delisted Adam Oxley, while Ben Sinclair retired. Sinclair has struggled with multiple concussions and leaves the game as a 26-year-old having played 63 AFL matches. Oxley will be offered a rookie lifeline if he is still available. After the recent conclusion of the trade period, clubs move into the next important phase of list management, with delisted free agency to open on Wednesday. The Gold Coast Suns, as expected, late yesterday delisted Trent McKenzie, who is reportedly on Port Adelaide’s radar, along with Daniel Currie, Matt Shaw and Mackenzie Willis. It follows the Power letting go veteran speedster Matthew White on Sunday, along with Jesse Palmer and Brett Eddy. The national draft will be held in Sydney on Friday, November 24.